The tutorial was pretty clear about what to buy and how to assemble, so I won't go into great detail there. The only thing that made my project different was getting it into my messenger bag. - It wouldn't get snagged on anything. But I did want quick deployment. If it took more than a few seconds to get the panel out and secure it, I knew I'd never use it. 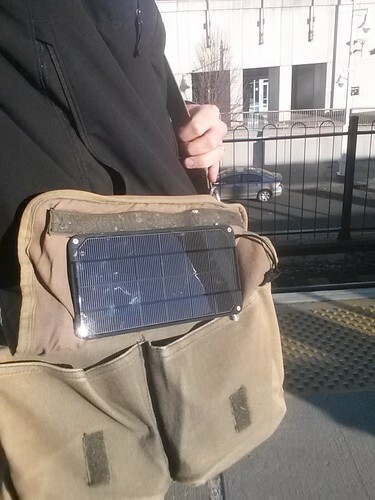 To accomplish this, I attached the panel to the inside of the large flap of the messenger bag, rather than the outside. When I'm out in the sun, I fold up the bottom half of the flap, exposing the panel. A carabiner clip holds the flap in a folded-up position. An additional strip of velcro keeps the bag itself closed, even when the flap is half-up. 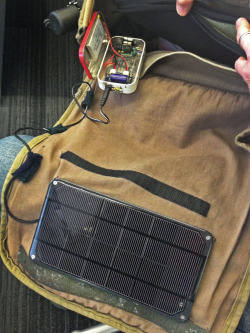 The solar panel itself is attached with velcro: one side on the back of the panel and the other side sewn to the bag's flap. Additionally, I ran elastic bands (the white stuff in the picture below) from corner to corner on the back posts of the panel, through slits I cut in the inside layer of the flap (note the terrible black stitching around the slits). Then I tucked the posts into the slits, so the panel is flush with the fabric. The power cable runs back inside the bag, where I have the battery/charger unit in a pocket sewn to the side (note the use of an old sock for material). A micro-USB cable runs from the charger to the outside pocket via a small hole. This outside pocket is where I keep my Kindle and headphones. Both use micro-USB for charging, as does my phone. Patching the solar panel cable in the middle of the cable. When I fold up the panel, the cable bends right at my patch point. My soldering gave way once already. I repaired it, and the second time I put a plastic strip inside the heat-shrink tube before heating it, to give the cable some rigidity at that spot. It bends awkwardly now, but it's stronger. Putting the panel too close to the velcro strip that keeps the bag closed. They're right up against each other. The panel prevents the velcro from making a good connection with the other strip, so the two sides often separate. This isn't too much of a problem, as it just means the flap dangles down instead of being secured down. Made my hole in the Altoids tin too big. I have a fear that small items may fall in. However, this does have a silver lining: When I look down into the bag, I can see through the hole to the LED that indicates that the panel is properly charging the battery. So I know if my soldering connection comes loose again, or if something else is wrong. It's been a few weeks now, and the charger is holding up great. I haven't had a critical need for it yet, but it's nice to know it's there. And it was a lot of fun to build.